It is time for us to have a little bit of entertainment and to go on a road trip with Medvedik, who grew kind of impatient by just staying in the peaceful hotel all the time. I picked up the colourful travel book and browsed through looking for places of interest to visit in Mauritius. “Need to explore something green with lots of fresh air”, I thought, unwilling to come back to the land of baking sun and occasional bushes. Botanical garden sounds like a great idea then! I asked around to find out who is willing to join my adventures, but apart from the greedy for money driver, I couldn’t find anyone who would want to go see the exotic collection of trees from all over the world. I hesitated a bit for taking a cab, the garden seemed to be close enough, so I rented a bike instead. This made me feel a much better ecologically conscious bear, although the bike was quite squeaky. At the gates of the garden there was a guide waiting for me. In fact, the guide was not exactly waiting for me, but he was so happy to see a visitor, that I could not say no to him. The excursion started with a story about the gates, which were delivered to this botanical garden from … but I got already allured by a massive Baobab at the entrance of the garden. I had never seen anything as thick and impressive in my life. Well, icebergs are quite impressive too, and it would be the coolest thing in the world to see a baobab on an iceberg, I thought. Of course, the first thing I attempted to do after seeing such a massive product of Mother Nature was to climb it. In the beginning it went really well, but then I saw an enormous spider, occupying one of the gigantic tree branches. It gave me such a fright that I immediately fell off and landed right in front of the tour guide, who continued his never-ending story about trees and bushes. The garden was fantastic, filled in with all kind of fresh smells and lovely-looking plants. I had really good fun playing in the alleys and trying to cross the channel in Victoria Amazonica leaf, playing with the lotus flower, swinging here and forth on the lianas. Right at the exit of the garden, I saw a beautiful deer. – Hi, deer! – said Medvedik. – Would you like to make a new friend and maybe go have a cup of green tea somewhere around? 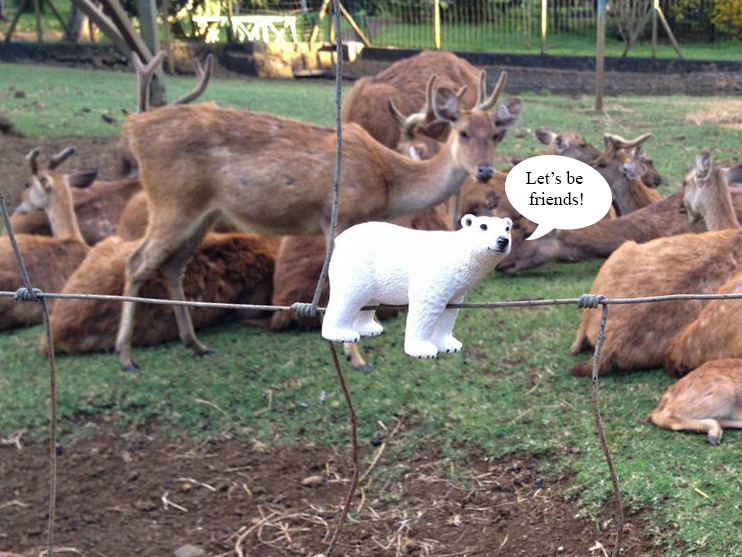 – Hello, Little Bear, – the deer answered lazily. – To be honest, I am very well here with my pals, enjoying some fresh grass, but you can leave your business card and I will call you later. Maybe. I didn’t have a business card as well as I didn’t have any business. I left the garden, found my bike parked on the side, and left in the direction of the hotel, contemplating about the type of beary business that I could start in order to be able to leave business cards and make friends with deer and other animals. 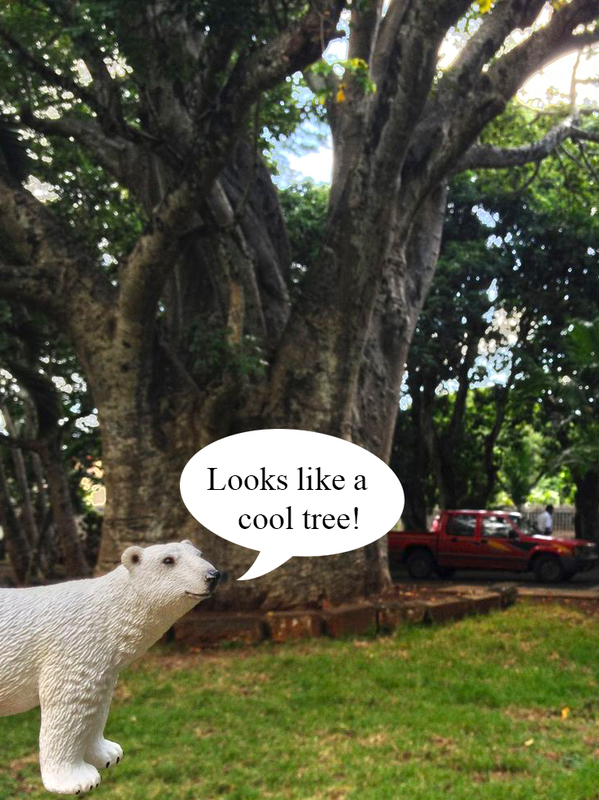 This entry was posted in New Exbearience and tagged arctic, baobab, bear, bears, beauty, bicycle, botanical garden, deer, experience, flowers, fun, funny, garden, image, mauritius, medvedik, nature, park, photography, photos, pictures, polar bear, story, toy, travel, traveling, travelling, tree. Bookmark the permalink.